Preheat oven to 350 degrees. Slice baguette into 1/2" slices. Arrange baguette slices on large rimmed baking sheets; brush both sides with oil (or spray with cooking spray). Bake until golden brown, approximately 15-20 minutes and turning crostini over once during the baking). Let cook on baking sheet. Place about 1 tablespoon of goat cheese on baguette slice. Add slice of peach and chopped basil. Drizzle Balsamic Reduction over crostini. This recipe uses measurements loosely. 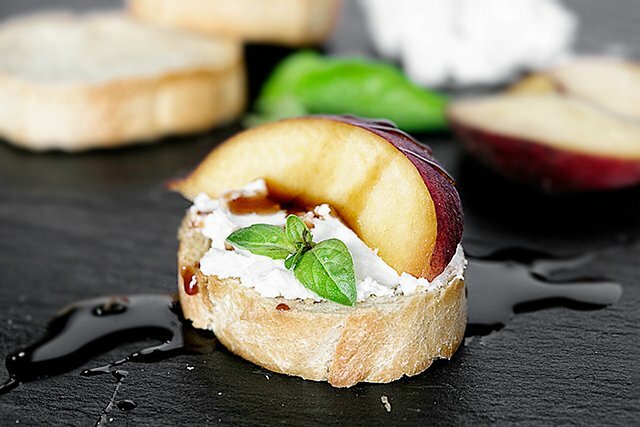 Add the mount of goat cheese, basil and balsamic reduction to your taste.